I was initially scared of trying Dark Souls. 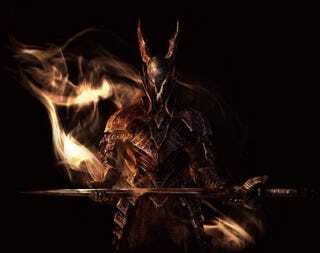 Demon's Souls gave me fits when I played it on my PS3. But I picked it up anyway—sanity, patience, and controller be damned. I died at least 15 times during the first 30 minutes. I screamed that the enemies were cheap because the first boss kept smashing me into a stain on the ground while I was down. I then quit the game and didn't touch it for several days. During this time, it gnawed at me. So I researched on how to get better at it. That's when I realised my mistakes: I should've been more deliberate and observant. I should be quick on my toes and focus on playing defensively. More importantly, the game was fair; I got killed repeatedly because I was careless. When I returned to the game, I noticed that I improved considerably. I still got killed, sure, but again, it was because I was suddenly careless. I actually started enjoying Dark Souls. Right now, I just beat the Black Knight at the Undead Burg; the accomplishment was immensely satisfying. I know that I still have a ways to go, and my character will surely die countless more times, but I would be better prepared for it. Here's what I realised: Dark Souls is an action RPG. Its "experience points" are the souls that you get after slaying an enemy. You can level up just like any RPG, but you—the player, not the avatar—also level up in terms of overall skill while playing the game. You learn how to properly handle your weapon and time your attacks. You master how to parry and riposte. The "meta" aspect is pretty darn awesome! And when you do figure out how to beat certain parts of the game, the satisfaction is really different compared to the entertainment that you usually get from merely playing any other game that didn't really challenge you much. The PC version is a given. What I resent is that it&apos;s taking so damn long.